It’s about time for a giveaway and we have a great one lined up for you today! Some blogger friends and I have joined forces with Safeguard Armor to bring you the chance to win the latest in covert body armor protection. 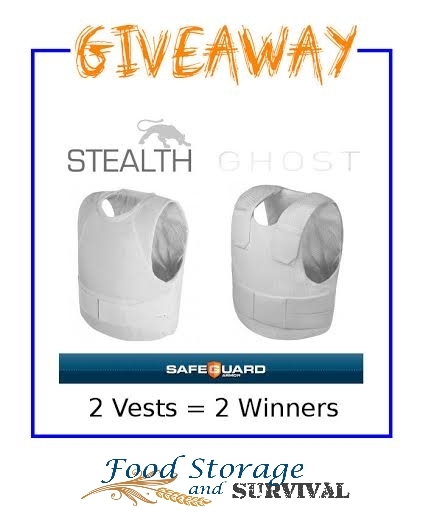 We are giving away 2 vests, the Stealth and the Ghost each valued at $476! There will be two winners–the first winner will receive the Stealth and the second will receive the Ghost. Check out this post at The Prepper Journal for 10 reasons a civilian would want body armor. 100% DuPont™ Kevlar® armor panels. Weight: 2.5kg depending on size. *An NIJ Level II bullet proof vest will provide protection against regular powered 9mm handgun, up to .357 Magnums. NOTE: Please be aware, it may be unlawful for you to own body armor. In most cases, law-abiding citizens may purchase (except in Connecticut where it has to be a face to face sale), but if you have a felony conviction, federal and state laws may prohibit you from owning body armor. Please check your local regulations before entering this giveaway as we cannot do that for you. If you win this Body Armor, it must be legal for you to own and posses body armor. Some States and areas prohibit this as mentioned above. If you win, but are prohibited from owning body armor, we will choose another winner. To enter, simply fill out the Rafflecopter form below. Each option you complete gets you another entry in the giveaway. This giveaway will end Monday, March 10th 2014 at midnight EST and the winners will be notified by email. Please read the terms and conditions on the giveaway widget. Good luck!